From the creative minds of two love struck artists David Horvath and Sun-Min Kim emerge the Uglydoll family! What started as a drawing of a playful orange character known as Wage has turned into a whole new world of fun! In 2001, when David's soon to be wife and creative partner Sun-Min had to return to Korea, he sent her many I miss you letters with his little Wage character drawn at the bottom. Sun-Min sewed Wage into a plush doll and sent him to David as a surprise gift. David asked Sun-Min to sew a couple more for the Giant Robot store in Los Angeles and they sold out in one day! A very excited Sun-Min sewed many more and those sold just as fast! Sun-Min and David then began to pull more characters from the Uglyverse, a universe where UGLY meant unique and special, to translate into plush Uglydolls. They both met again at their very first Uglydoll Toy Fair booth (a small 6x6 booth made of felt and wood) in New York, where they would go on to win Toy Of The Year 4 years later! Now the award-winning Uglydoll characters are available in a variety of sizes and styles of plush, and are available at specialty retailers worldwide, and you can learn all about the Uglyverse through the Ugly Guides published by Random House. Oh and Sun-Min and David are married and have little uglys of their very own. 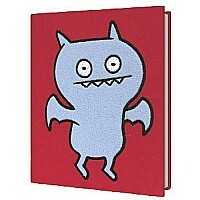 Join them every year at the Uglycon Uglydoll fan convention/art show!